Once your lawn has taken root and it not easily lifted it is ready for its first mow. Your first mowing should only be a light trim and then gradually lower your mowing height each subsequent mowing, never taking more than one third of the leaf height. 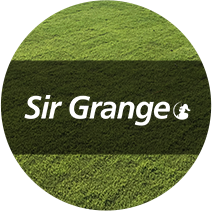 Sir Walter, Platinum Zoysia and Tropical Carpet Grass Mix need to be kept between 30 and 40 mm. Nullarbor Couch needs to be kept quite low 20-25mm. Keep an eye out for lawn grubs or disease and contact us immediately if you spot any signs of dieback or heavily chewed leaves and we will advise you of the best course of action to remedy any problems. Top dressing may be necessary to fill in and uneven areas in your lawn surface. Medium sand is recommended. 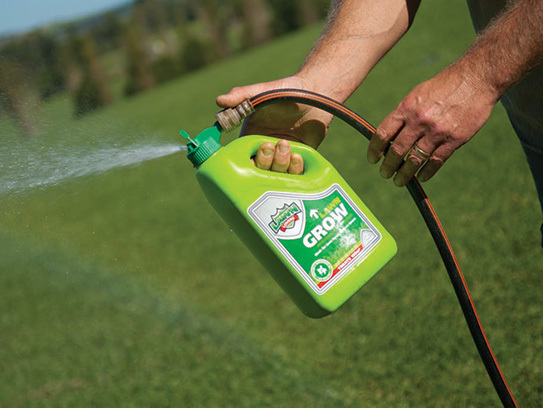 Make sure to only use a small amount at a time as too much may smother your turf. Place a layer on and let the turf grow through, then reapply until the uneven area is filled. 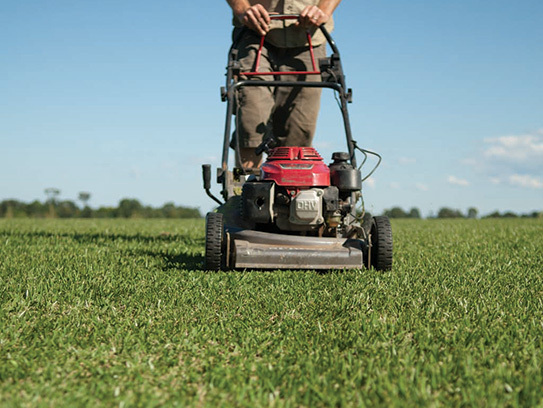 Don’t hesitate to contact us for more lawn care advice if you have any queries. 1. When can I mow my turf? 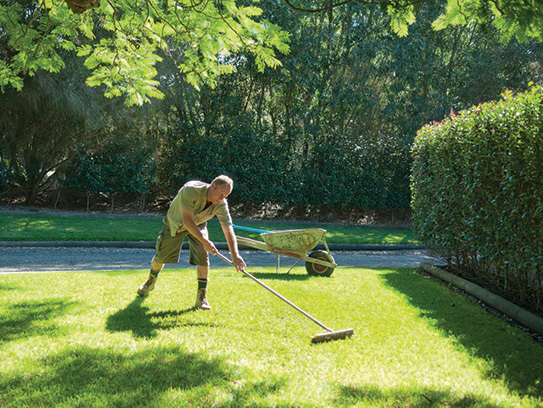 You can give your lawn its first mowing when it has taken root and it not easily lifted by hand. When you first mow after establishment it is best to mow at a high setting and gradually lower the blade height over the next few mowing sessions. Make sure you do not take any more than a third of the leaf height each cut. 2. At what height should I mow my turf? 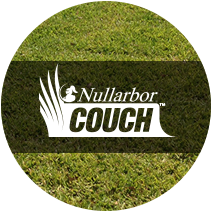 Nullarbor Couch should be kept at 15-30mm height. 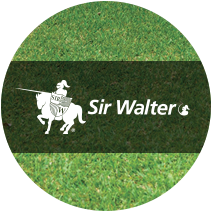 Sir Walter, Tropical Carpet Grass Mix and Platinum Zoysia should be kept at 30-50mm height. If your grass is in the shade it should be kept a little higher to increase photosynthesis. 3. How often should I water my turf? Initially you will have to water your turf several times a day ensuring the turf does not dry out for the first 3-4 weeks during the crucial establishment period. After the turf is established (unable to be easily lifted by hands – roots secured) you will only have to water every one to three days. Look for signs of stress that will tell you your watering schedule is not suitable: if the turf is looking dry, pale or the leaves are curling in you will need to increase watering. If the lawn is looking water logged reduce watering. During the wet season water as is necessary. It is best to water your lawn during the morning hours rather than in the afternoon or at night. 4. Do I need to top dress my turf? 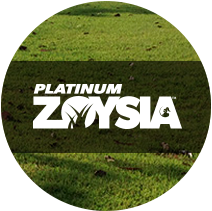 You won’t need to top dress your turf initially – top dressing is used to repair damage or rectify an uneven surface. If once established, you would like to top dress, the best way to do this is a gradual process – lay some sand or sand/organic mix in the uneven area and rake through the grass. Make certain that you do not over do it; the leaf should still be visible. A few applications may be necessary – wait until the turf has grown through and then reapply. Top dressing should always be done in the wet season when the turf is growing. 5. How often to I need to fertilise my turf? 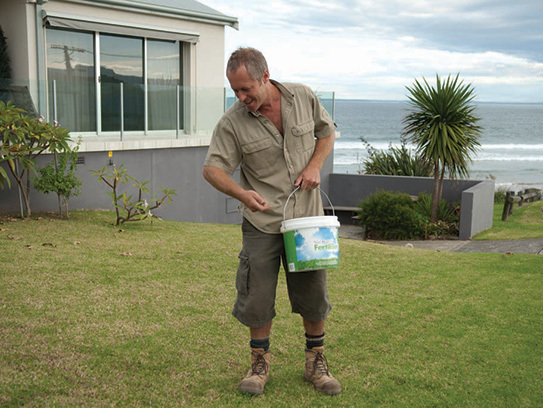 It is usually necessary to fertilise your lawn every 2-3 months using a turf NPK blend. 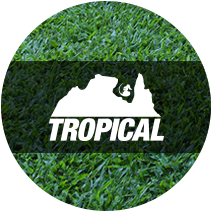 We stock a variety of Lawn Solutions Australia fertilisers. Just ask our friendly staff for advice.